Investigate the place properly where the work needs to be performed and remain aware of the power lines especially when using long tools like ladders. 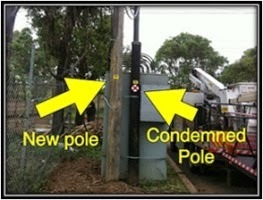 It’s vital not to work or use the equipment within the 10 feet of overhead lines. Don’t take any chances as it would be extremely dangerous if you don’t follow this 10 foot rule. Good caution must be taken when working on the roof to execute work such as gutter cleaning, installation of the satellite dishes or any other type of patch up work. If there are trees near power lines, never try to climb them as limbs and branches can turn or break away and eventually you could fall. 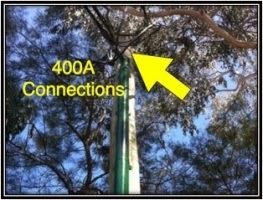 Don’t ever try to trim or cut trees that are located near to power lines just leave that work to a professional. Nevertheless, how boring and dull it may seem always follow safety measures. Don’t use metal ladders near power lines instead you need to use non-conducting type of ladders (that comply with Australian standards) for performing work near the energized power lines. The people who work near overhead power lines should have good knowledge and training regarding handling emergency communication and know the right techniques for offering help to any person right after an electrical accident has occurred. It’s highly advisable to make use of safety watches or spotters; helpful to keep a watch over the work and to communicate with the operator in order to make sure that the equipment never gets nearer than 10 feet of a power line. When you find somebody who needs urgent help, right away Call 000 - the emergency helpline number. Never try to touch the victim because chances are there that you might be electrocuted. AJI Electrics has Level 2 Electricians in Sydney who are licensed and experienced to execute all types of Level 2 electrical work including working on overhead power lines. AJI Electrics also provides emergency electrical services.